THE RAPID rise of the middle class in Asia and the chance to value-add grains into other forms of protein are just two of the opportunities underpinning the long term future of the Australian broadacre cropping industry. That’s the view of Western Australian farmer and agricultural leader, Peter Roberts, who recently stood down as the Grains Research and Development Corporation’s (GRDC) Western Panel chair after serving in the post for the past eight years. Mr Roberts said Australia was well placed to take advantage of rising affluence in Asia where an estimated 700 million Chinese could increasingly afford to pay more for better quality food. “We are relatively clean and green and have systems in place to make sure that what they want is what they get,” he said. However, Mr Roberts said agriculture faced some serious threats and challenges that it needed to address – especially the increasing pressure from the wider community on farming’s social licence to operate. He pointed to the latest fracas over the use and potential banning of the herbicide, glyphosate, as a symptom of the broader issues facing agriculture in a world of heightened scrutiny from an urbanised public. “The real issue for agriculture in Australia, and worldwide, is how do we satisfy the urban environment that requires much more scrutiny of agriculture?” he said. “If you look at the European Union, there is a whole list of herbicides and fungicides that have been put on a watch or ban list. “We now have policy driven by social media. Very quickly, people and organisations that are very credible are branded as not so and scrutinised within an inch of their lives. It’s twisted to make them look like the bad guys. The APVMA does a very good job of regulating. “The indications are you have to bring the urban voter along with you to be able to continue to farm. Mr Roberts, who started farming at Dunn Rock in southern WA as a New Land farmer in 1982 and continues to operate the farm with his wife, Julie, said advances in plant breeding, soil management, farming systems and inputs had been critical to the ongoing productivity and viability of Australian farms. “Without the technology of herbicides, no-till and weed control, we wouldn’t be producing the grain we are producing now. We would have stopped producing that 10 years ago,” he said. “When people ask me what has changed in farming, when my father farmed what they called a “10 bagger” was a good crop – that’s 2 tonnes/hectare. But, they grew that once every four years on a ley pasture system. And by the way, they grew it on 30 per cent more rain. “Now, in the same environment, we consider 2t/ha just an average crop every year on 30pc less rainfall. We have made strident changes in agriculture to be able to achieve that. Mr Robert said while agriculture was currently under-valued in many quarters, he was confident the time would come when it was seen in a more essential, positive light, especially as pressure built to feed a burgeoning world population. “At some stage, rational thinking will occur about the value of agriculture. Right now, it is an easy target and everybody likes to kick it. But rational thinking will have to kick into gear when there are other drivers like economies not being able to feed themselves,” he said. “People won’t starve before they start throwing rocks. You see that around the world. Whenever there is food insecurity, things happen long before it becomes a serious issue. Mr Roberts’ interest in becoming involved in the broader agricultural community to improve farm productivity began in the early 1990s when he joined a grower group based out of Esperance, the South East Premium Wheat Growers Association. The Esperance port zone, at the time, produced a lot of poor quality grain. Growers there decided they needed to do something about it. They looked beyond local plant breeding stock to material coming out of South Australia that was more relevant to the southern part of Australia, particularly in relation to sprouting tolerance and rust diseases. “That made a hell of a difference to the port zone from an area that was traditionally pushing 30 per cent of its grain out as feed-type quality to now where only about 2pc ever goes out as that,” Mr Peters said. 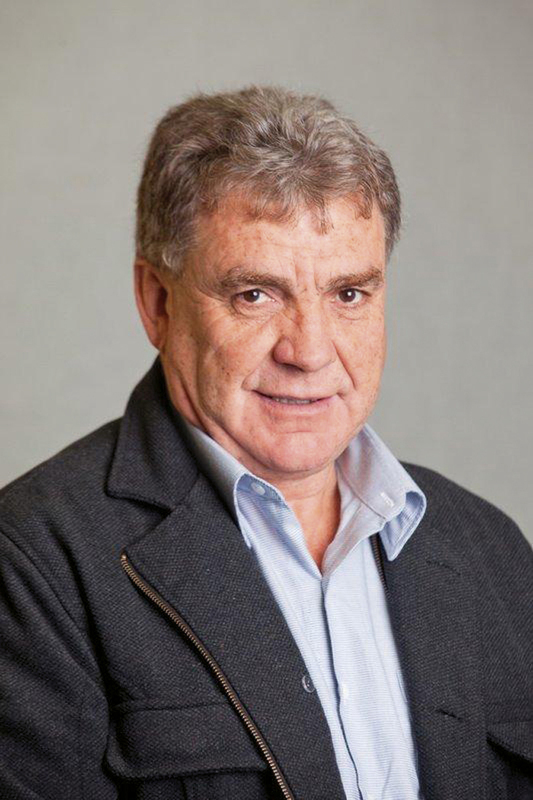 In 2007-08 Mr Peters filled a vacancy on the GRDC Western Panel, joining like-minded growers, agronomists and researchers to deal with issues facing the cropping industry from a regional and national perspective. 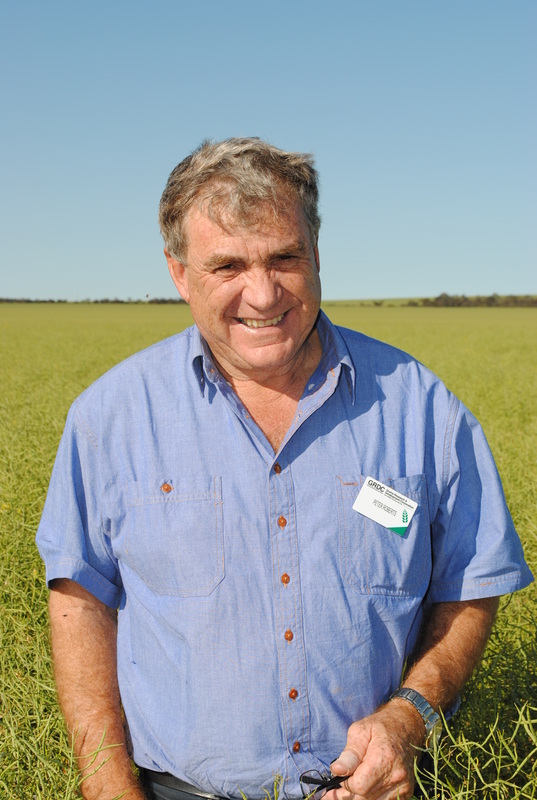 In 2010, the then chair of the GRDC Board, Keith Perrett, appointed Mr Roberts chair of the Western Panel, a position he held until recently. During that time, much of the research focus was on issues of soil productivity and “understanding the ‘bucket’ we were trying to work with”. 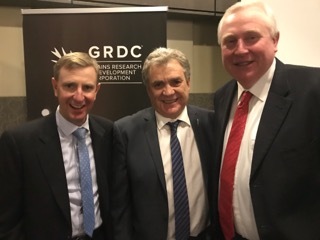 Former GRDC Western Panel chair, Peter Roberts (centre), with former Southern Panel chair, Keith Pengilley, and current Northern Panel chair, John Minogue. “We had a large effort nationally on how to ameliorate soil constraints. In the West the big issue was around acidity which was the biggest constraint in our area; then compaction; then non-wetting soils; sodicity and gravel soils. 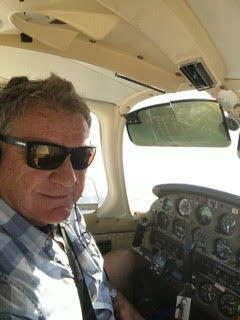 The big change in WA farming has been to be able to deal with the soil constraint issues,” he said. Mr Roberts said a very large investment was made into weeds research and the spiralling issue of herbicide resistance in WA through the Australian Herbicide Resistance Initiative (AHRI). “We moved into the lupin/wheat rotation in WA in the late 1980s/1990s and, because we were using the same groups of herbicides, very quickly ran into herbicide resistance in radish and ryegrass. That was the precursor for all that work. The flags were up for the rest of Australia,” he said. Mr Roberts said the weeds research effort put in by the GRDC and AHRI had been a great success story with WA now a leader in the fight against herbicide resistance. “It has certainly worked. We have growers in WA now who thought their paddocks were going to be out of grain production because of the resistance issues, but now they have been able to bring them back in because we have been able to adopt a whole lot of harvest weed seed containment strategies,” he said. While Mr Roberts has stepped down from his role with GRDC, he plans to continue farming at Dunn Rock and maintain an active role in agriculture. “It courses through my veins. It is an exciting industry. I love being involved in it. I sit on the edge of the politics of agriculture and stick my toe in it when I need to. I am more focused on the fundamental things growers can employ on their farms to make things better,” he said.